Take a look at 20 gorgeous Indian wear outfits for the occasion of Baisakhi. Dress-up in style and celebrate the spirit with great fervor! Baisakhi is right here! Hope you are thrilled and excited. Well! And why shouldn’t you be. It is actually a festival of music, dance and cheer. With a stunning hairdo, probably a braid or a bun, gorgeous eye makeup, perhaps a bit of a shimmer, heavy mascara and lovely blush, you maybe all set for today..However, Zuri would also like to make sure that your attire goes well with the festival’s theme. Therefore, take a look at 20 spectacular Indian outfits to choose from to dress up for Baisakhi party. From Ivory and red chikankari short kurta set to a pink silk salwar and neon green net dupatta, from a kurta-ghagra to an asymmetrical yellow kurta and black Patiala salwar, from a designer phulkari saree to an ethnic suit with a sheer hand woven silk fabric dupatta that talks softly of all the chirpiness of colorful floral prints. For a graceful and ethnic look, you can also pair your traditional dupattas or colourful stoles with pastel colored anarkalis and churidars. There are plenty of options for you to pick from. Besides, you can flaunt such a trendy (yet traditional look) for a Baisakhi lunch or an evening get-together with an ease even at a friend’s farmhouse. Don’t forget to wear your accessories, such as parandi (hair ornament/extension), jhumkis or maang-tika. They are meant to complement both traditional and Indo-Western fusion wear. Indians always love colour and rich detailing, but what is of greater significance is the fit. That’s why Zuri has cherry-picked such an amazing assortment of Indian wear which reflects global fashion with skilled tailoring. 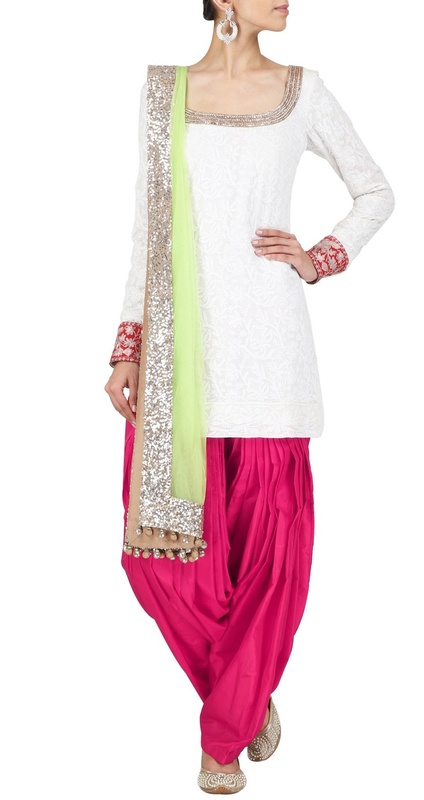 We are not just sticking to Pakistani suits, Patiala salwar kameez, kurta ghagra, designer sarees, and anarkalis. Infact, if you are a newly-wed, then you can also celebrate your first Baisakhi with a splendid lehenga look. 2. Make sure you choose the right shape of lehenga, because there are several types available in the market: fishtail, A-shape, full-circle. See, what suits your body type. 3. There are several ways of draping a duputta. It depends a lot on the ongoing trend. But, you should also see what makes you feel comfortable. 4. Don’t be afraid of wearing a short blouse (also known as choli). You can give your lehenga a saree look by opting for a short blouse. But, if the occasion demands a bit of a conservative dressing, then you can also flaunt a long choli (Rajasthani style) gracefully. 5. Choose the right amount of accessories, if the lehenga is quite heavy. don’t overdo it with the accessories. Nobody likes to see a walking jewellery shop!